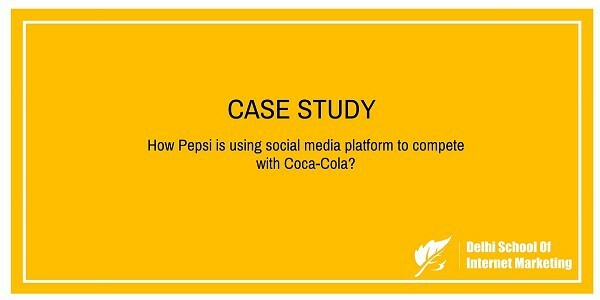 CASE STUDY: How Pepsi is using social media platform to compete with Coca-Cola? Home > Blog > Blog > CASE STUDY: How Pepsi is using social media platform to compete with Coca-Cola? The aerated beverage industry is dominated by Coca-Cola and it has many rival companies in the local market but internationally Pepsi is the only brand which is giving Coca-Cola a bit of competition. The Coca Cola and Pepsi war is legendary. So to have a quick understanding of the business model and marketing strategy of both the cold- drink companies, here is a quick overview of how Pepsi use social media platforms like Facebook, Twitter, and Pinterest. Pepsi has a huge Facebook fan following with more than 34 million users. But the industry looks more in favor of Coca-Cola as we can look at its Facebook fan page with fan following of a gigantic 95 million fans. The most recent update on Pepsi’s Facebook page is the latest TVC ad. The video worked in the favor of the Pepsi brand and it quite user engaging. Till date it has 907K views with more than 30K likes and around 1400 shares over the Facebook platform. The post on the official Facebook fan page has very few reaching more than 100 likes and comments. However, the sub-brands of Pepsi have done a far better job of posting fresh content and responding to fans comments. Talking about “Pepsi Max”, it really posts new updates nearly every day, most recently centering Christmas with the hashtag ‪#‎ChristmasJumperDay‬‬‬‬‬‬. The updates presenting Dynamo’s bus levitation trick achieved a huge amount of interactions and were viewed more than 6 million times. In general Pepsi Max’s updates achieves a few hundred ‘likes’ and comments with having more than 1.1 million fans. Pepsi has a lot of confusing Twitter accounts for its various categories. Some to name are PepsiCo, Pepsi Max, Pepsi Next, Pepsi Max Crew, PepsiCo Deals, and PepsiCo Jobs. The Main Pepsi Account, till date has attracted millions of people and the count has reached upto 2.95 million followers over the platform which is very much close to Coca Cola’s 3.15 million followers with a mere difference of 2,00,000. Pepsi has a great social media team who tweets several times each day with the main focus being on the brand’s association with the customer. It had launched its first global campaign ‘Live for Now’ in the year 2012. The main motto of the social media team is to promote Pepsi as an exciting, youthful and remarkable brand that people associate with having a good time, so its feed is full of hashtags such as #LiveForNow, #IconicSummer, #PoolParty and #duh. The Cola brands have grown their consumer base using the social media platforms and have received a huge response in the market. Both the top brands in the segment have implemented many campaigns to kick-up its business. However their campaign being a success provided them huge response from the customer side. Here are the various advertising campaigns that helped both the brands i.e. Pepsi and Coca-Cola grow faster. PepsiCo brand includes many products in its portfolio. But the top in the cold drinks segment remained Pepsi, mountain Dew and 7 UP. These items helped PepsiCo in growing and evolving the brand. Pepsi established its business operation in India in 1989 and launched its first product to Indian markets after the economic reforms of 1991. Pepsi: The first ever campaign that Pepsi started in India was #Yehi hai Right Choice Baby, which has been one of the most notable campaigns of the brand, presenting celebrity endorsers such as Shah Rukh Khan, John Abraham, Aishwariya Rai, Priyanka Chopra and others. Later other campaigns were also started that includes #Yeh Dil Mange More and #Yeh Pyaas Hai Badi. Ranbir Kapoor and Deepika Padukone were contracted for Pepsi’s Youngistan campaign targeting the youth. Both the cine stars also successfully performed in the campaign #Oh Yes Abhi. #Yeh Dil Mange More campaign was a huge success for PepsiCo having a blend of emotional as well as the functional appeal of the product. This campaign was among one of the longest running campaign operated by PepsiCo India featuring Sachin Tendulkar and many other significant stars at that point of time. Mountain Dew: The campaign of Mountain Dew started with #Do the Dew and later changed to #Dar Ke Aagey Jeet Hai. The first campaign was not clear with its appeal and the brand as a result got some downfall during initial period. But with the introduction of the latter campaign, Pepsi gave a “no fear image” and the brand directly competed with Thums Up from the Coca Cola brand. Although Coca Cola and Pepsi had the same product portfolio, the campaigns implemented by Coca-Cola was quite different from that of Pepsi. As Pepsi had started its product offering in India from 1989 onwards, the later i.e. Coca-Cola was in India since 1977 but later it was forced to exit the Indian market. But when the company returned to India market after liberalization, it came up with an ground-breaking communication and advertising strategy. Coca Cola: The first campaign started by Coca-Cola was #Jo Chaaho Ho Jaaye, Coca Cola Enjoy. It was a remarkable campaign started by Coca-Cola. The campaign featuring celebrities like Hrithik Roshan and Aishwarya Rai was very well executed appealing emotionally as well as functionally to the target segment. In the initial period of the campaign, the brand focuses on the youth and the company succeeded in its motto. However the second advertising campaign of #Thanda Matlab Coca Cola was for the launched targeting the masses. With the current campaign of #Open Happiness, Coca-Cola seems to have accomplished both, an emotional mix as well as a mass appeal. The brand carried out actual and natural connection with the target segment that of enjoying every day, and sharing small moments of happiness with our loved ones, irrespective of any fences. Sprite: Sprite started its ride with the campaign named #All Taste No Gyaan. The campaign appealed impressively to the youth who don’t like to be addressed and enjoy own logic. Sprite has targeted the youth segment and has never hinged on to any celebrity. The ads are designed and implemented in a very well manner to get a natural connection with the target audience by capturing every day moment. #Seedhi Baat No Bakwaas was its later and currently running campaign. This campaign connects directly with the real life of the target audience. The emotional arena of the campaign was much appealing that shows the maturity of the campaign. [su_box title=”More Case study from DSIM:-” box_color=”#c7c7c7″ title_color=”#000000″ radius=”5″]1) How Cadbury used Twitter to increase fan following and brand awareness? 2) How Sharekhan increased leads count through a training campaign leveraging digital marketing? 3) How MobiKwik became India’s leading mobile wallet company in just 6 years?